Being ungrateful is a result of being held in the cell of despair and the confinement of deception. When we live only by what we see in the present rather than all He has promised, we slam the prison door on our hopes and throw the key away. God is ready for you to ask Him to help you make a prison break! When Dorothy was told all she needed to do was to click the heels of her ruby red slippers three times and repeat the phrase “There’s no place like home”, it must have seemed all too simple… yet she did it and it worked! Could it be, that the Lord is holding out the key that will release you from your incarceration to a lack of appreciation? If you are not thankful, at least be honest about it. Then, be humble and ask God to break you out! What are you waiting for? See you on the outside. It’s amazing out here! We love the open invitation of Jesus to “Ask and it shall be given unto you” found in the sermon on the mount. In the same way, I am moved to persistent hope given by Jesus when he taught that men ought to always pray and not lose heart. (Luke 18:10) Even David said he would have despaired if he had not believed that he would see the goodness of the Lord in the land of the living. The answer simply is YES! Surrendering to the undesired will of God may come as a crushing heartbreak of a young man or woman who watches the love of their life walk down the aisle with someone else. Or it may come through the painful perception that God has chosen not to heal you or someone you love of a life threatening disease. There are a myriad of ways that God can simply whisper “Enough my child” to our persistent passionate plea for answered prayer or renewed hope. Even someone as close to the Lord as Moses still was told “No” by God when it came to his desire to cross over the Jordan and see the promised land of Canaan. Then I realize when God says “No” to us we are actually in pretty good company. The Father even said “No” To Jesus when in the garden he asked if there was any other way than Calvary’s cross (Matt 26:42). The bottom line isn’t will God say “No” to you. No matter how long you have walked with Him, love Him or seek to reflect Him. There are “Nos” in your future. The question is what do you do when He says it to you? Do you become angry? Do you walk away from the Lord in depression? A pastor and his wife had one child. Their boy had become ill and the couple and their church family had begun to pray earnestly for the Lord’s healing in their precious son’s life. The man of God was sure God would heal his child. Many caring believers from church stopped in to encourage them to keep believing that God would intervene. Several even assured them that they were confident of God’s plan to heal their sick child. As the world is reeling in the tragic loss of life in Paris, we pray for comfort for the families of the deceased, healing for the wounded and peace and security for a nation suddenly in the grip of suicidal terrorists within their own borders. It is an unpopular idea that tragedies and acts of savage aggression are appropriate times to call people to repentance. This is seen as insensitive to those who are suffering and as a naïve perspective on both the causes of such evil acts as well as their remedy. Yet, as we approach Thanksgiving, we should be reminded of another Presidential Proclamation made by Abraham Lincoln just a few months prior to establishing this national holiday. In March of 1863, Lincoln called a divided, war-torn nation to a day of prayer and fasting. In that proclamation, there is a bold profession of faith in God and the holy scriptures. Then within the proclamation there is a clear connection made between the sins of our nation and the ongoing Civil War tragedy itself. Prideful, prayerlessness and ingratitude in response to God’s gracious blessings is pointed to as the possible root cause of the Civil War itself. Then a call is given to the nation to stop what they are doing, go to church, and fast and pray for forgiveness and healing of a broken nation. Two years later the Civil War ended, peace was secured and the nation began to heal. Is it too simplistic to believe the war on terrorism will be won on our knees or not at all? The mistake of those in Christ’s day was in looking to blame the victims for the evil acts of the perpetrator and interpreting their suffering as evidence divine personal judgment. Jesus says that the “take away message” from such a terrorist act (or any calamity for the matter see Lk 13:4-5) isn’t to focus on the guilt of the victims particularly but to realize our urgent need for repentance personally. In other words, acts of savage terrorism that produce universal shock should be taken as a “wake up call” to humble ourselves spiritually as individuals and ask God to forgive us. May God help each of us hear God’s“alarm clock” and refuse to hit the snooze button yet again! He was just a lad and he was tired. As he lay in bed ready to fall asleep, he heard it for the first time. It sounded like his master, Eli calling him. “Samuel!” the voice called. Samuel got out of bed and ran to where Eli was. 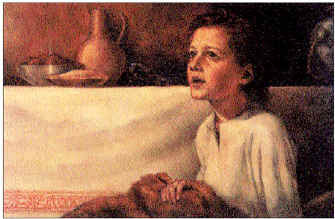 “Yes master, you called?” Eli said, “I didn’t call you, go back to bed.” After this happened twice again, Eli, the High Priest realized God was wanting to reveal himself to the boy Samuel. Eli told Samuel how to respond if he ever heard “the voice” calling his name again. Eli said “When you hear it say “Speak Lord, your servant is listening.” Indeed, that instruction was right on the money. When Samuel heard his name called later that night, he realized God was speaking to him personally. He didn’t need to ask anyone else to interpret what God was saying to him. In fact, Samuel began regularly hearing from God after this as God would reveal to him what was on God’s heart and what he wanted Samuel to speak to others. If you want to hear God speak to you more. Approach your prayer time and Bible reading time with the same approach as the boy Samuel. Ask God to speak to you personally. Perhaps even more important, make it clear to God you are listening as “a servant” and not as a spectator or even merely as a student. A servant has only one reason to listen to his master – and that is to obey. Paul wrote if we want to discern God’s unknown will for our lives, we must present ourselves completely to God as living sacrifices first (Rom 12:1-2). Consecration precedes revelation. It didn’t have a steeple, a cross, or a pastor for that matter. No opening song, offering or sermon. It was the smallest church I ever attended! In fact, we didn’t even realize we were in church! The two of them walked down that dusty road on their way to that town on purpose for some unknown reason. This day, it certainly would not be about the destination, it would be all about the journey. As they walked, they talked. There was nothing special about their conversation that day either, at least not until “He” joined them. They didn’t recognize Him as He began to walk with them. He appeared to be just another traveler on their road that day. They simply walked on and talked. The conversation turned to what had occurred recently in town. These were facts the two friends were surprised the stranger seemed completely ignorant of. They admitted they had believed Jesus of Nazareth was the long awaited Messiah. That is, until the Romans had crucified him last week. Now they were just discouraged and heartbroken. The Stranger told the two that they were not believing all that was written concerning the Messiah in their Bibles. He said, the Messiah was predicted to come and die and only then, to enter His glory. This kind Teacher then opened their minds to the Scriptures as He led them through passages they had read but never fully understood before. It was all there! How had they missed it? As they arrived at the fork leading to their destination, the wise Stranger appeared to be going further. They begged Him to stay with them because it was so late in the day. He agreed. As they sat to break bread, their Guest, took the bread and broke it in order to give it to them. As He did, they suddenly recognized the Christ they had been discussing theoretically was actually right there with them personally. Then suddenly, He vanished! Now, It may have happened as you spoke of Him with your spouse at the breakfast table, or discussed what heaven will be like with your grandchild. It could have happened when you paused to thank God for an evening out with friends while you all were still in the car or any of a myriad of other times and places. You see, gathering in His Name can happen any “where” we are or it can fail to happen “everywhere” we are!. Enough said. I think we now know what to do. In the book of Numbers, the very first thing we read is that God ordered a census of the fighting men of Israel. Now mind you, these men had been slaves in Egypt and although they were now “saved” they had not engaged in much warfare. There is a clear intention on God’s part that every man sees himself as a soldier and one who is ready to fight the enemy on behalf of himself, his family and all of God’s people. Among all of God’s people, God “counts” each one who is “able to go out to war”. That phrase is used 14 times in the chapter. Are you one that God would recognize as able to enter the spiritual conflict and fight? Each family of God’s people were represented by someone that could and would fight! It appears nearly all the men of every tribe were involved.